Elevation chart for today courtesy of Guthooks AT Hiker app. 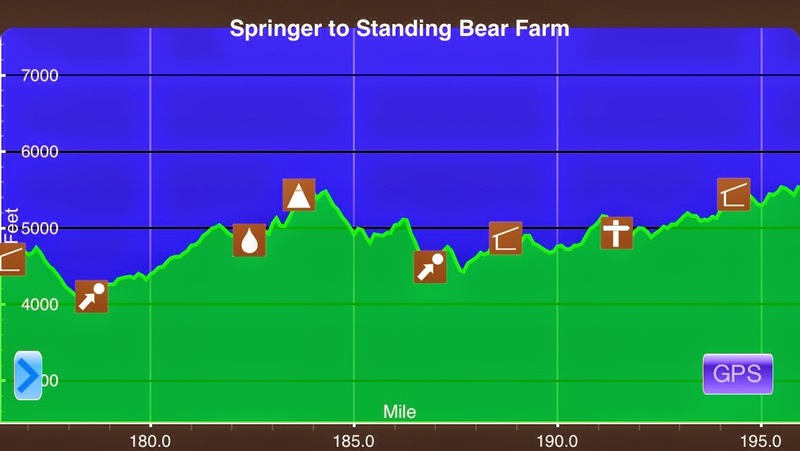 He has apps for many other trails including the PCT and CDT. Last night, I worked out my plan for going through the Smokies. My options are limited to where there are shelters, so that made today a lower day than most at 19mi. I wanted to try to strategize to avoid having to sleep in a shelter, so I decided to move slow today and hopefully arrive late enough that the shelter would be full by the time I arrived. I decided to start later, so I lounged in my tent and started at 8:30am. I don’t think I’ve ever started so late on the trail. The day was perfect with the temperature right around 70. 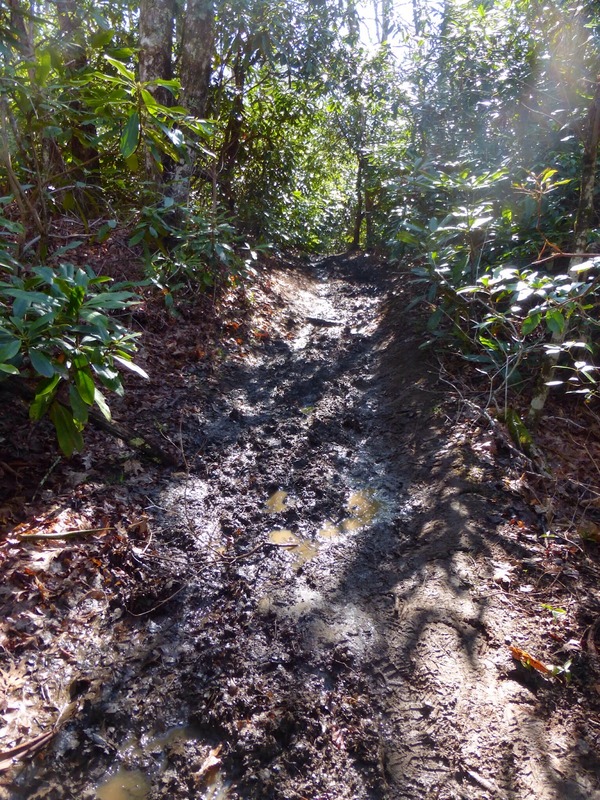 The first third of the day had lots of thick muddy trail that was fun to tiptoe around and dodge. It’s not as bad as it could be as I’ve heard that with more rain it becomes a full on stream and very slick. Yesterday, I mentioned the scenery hadn’t change much, but today there were some nice changes and it’s evident that spring is beginning to reach these high elevations. The trees are bare, but I can tell they are different from what I’ve seen thus far. There was a point that had panoramic views of mountains in the distance. It was very dry up top. In the forested areas there is a lot more grass and there were flowers covering the whole ground and that was nice. 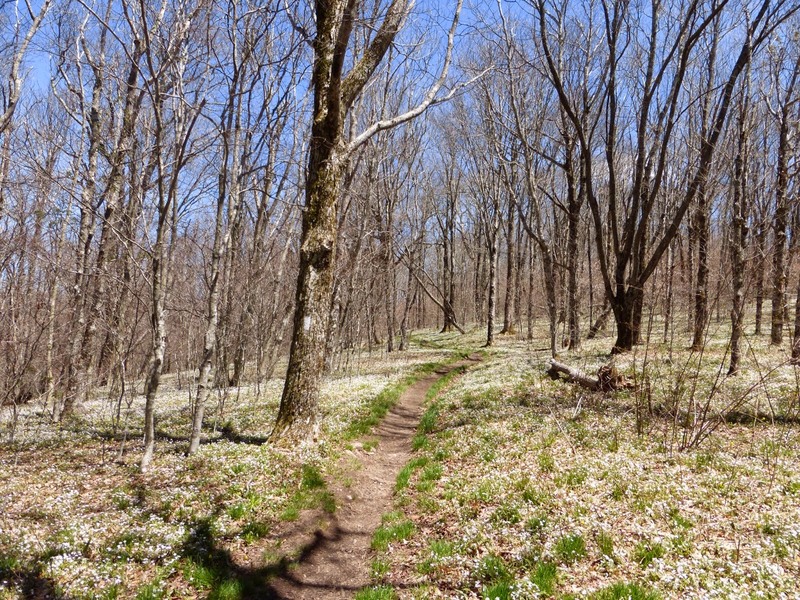 The ground was covered with the white flower, spring beauty as far as the eye could see and that was cool. There was also a lot of a yellow flower no one could identify today, so please let me know if you know it. The hiking was a good balance with short stretches of just about everything from steep ups and downs to level strolls. It was a good variety. I hiked the day on my own passing countless people the first half of the day. I caught up to Ace just before lunch and he sat and chatted with me while I ate. His plan was to stop at an earlier shelter, so I may not see him again. The second half of the day, I didn’t see anyone other than when I passed a shelter and I didn’t do more than a short greeting which is normal out here with so many hikers. It usually isn’t an extended conversation or full introduction unless you camp together or find yourselves overlapping frequently and that isn’t happening for me right now. I’m good with that and I’m enjoying being in my own little world right now. I listened to some music a bit on climbs and a new audiobook “Divergent,” which is entertaining. Thanks to Mike for gifting me that one! So nothing too exciting today. Just a nice stroll. 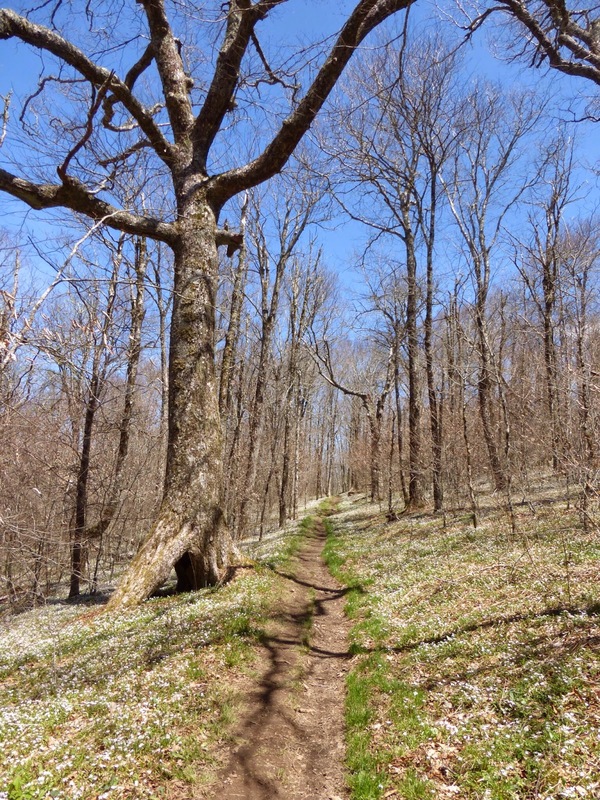 I can’t say I’m blown away by the Smokies, but I see the potential if spring wasn’t so late this year. 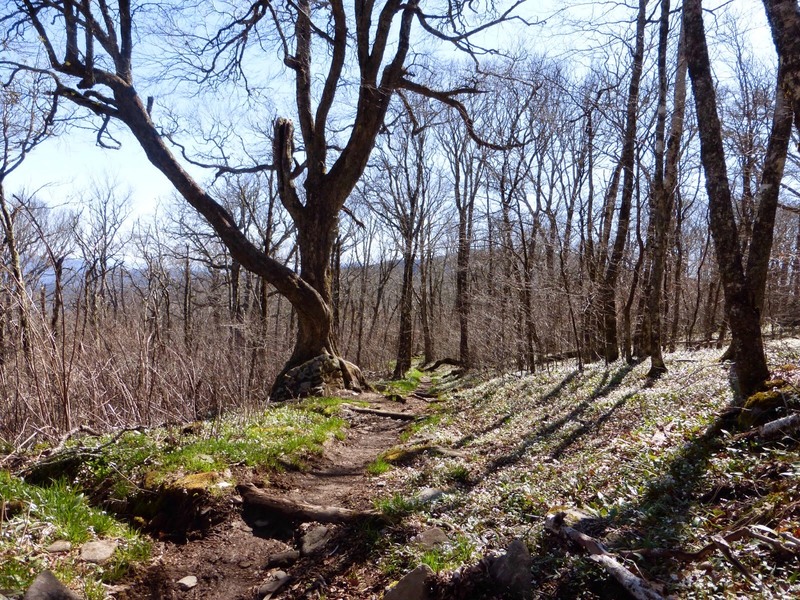 There are still a couple days left to see what else the Smokies hold. Something unique is that I noticed it was sounding like rain around me in the leaves along the trail. When I looked closely, I saw that tiny grasshoppers were jumping along my sides as I took steps. It was funny because it would be silent if I was still, but with any step, tons of them would jump and it would sound like rain only where I stepped. There was one bird that kept appearing all day that was quick and quiet. I finally got a picture of it from a distance, so maybe someone can name this. I got service just before the shelter and took some time to talk to my sister and do some emailing. Even with the late start and relaxed pace, I got to camp by 6pm. Luckily there are about 20 people here and I’m tented. It’s 9pm and there is a group of 8 or so thrus who made a fire and are talking loudly. 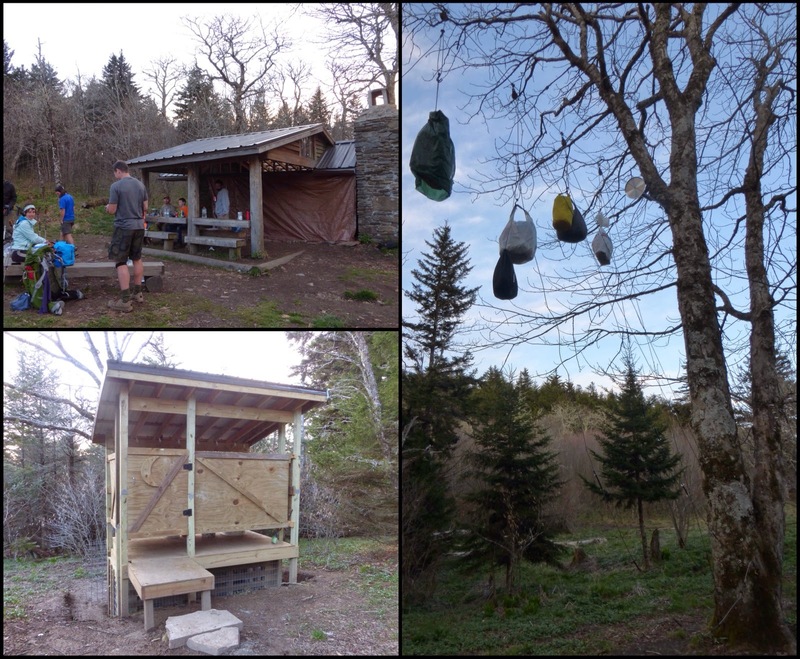 They are nice, but seem like they may be up late…here are pictures of how the shelters look, the privy(bathroom) and the bear hang pulley system. Tomorrow morning is Clingman’s Dome the highest point on the AT. Looks like I get to watch an episode of The Mindy Project before bed. Yay! 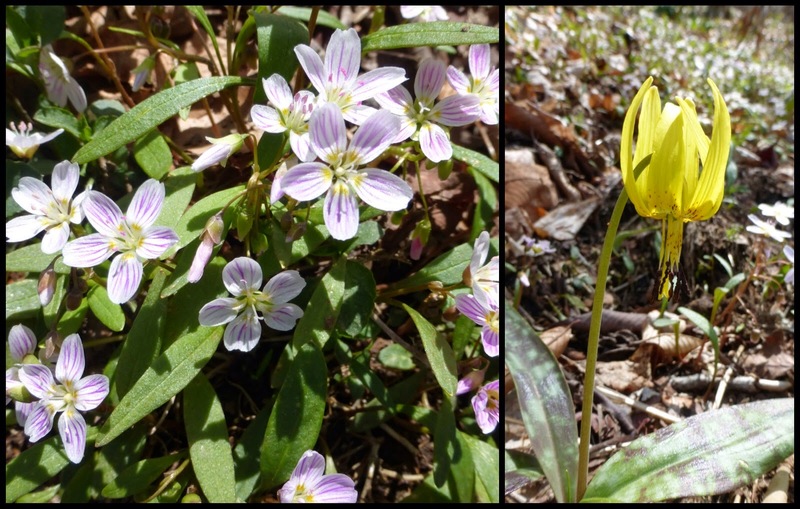 Your mystery yellow flower is a Trout Lily. 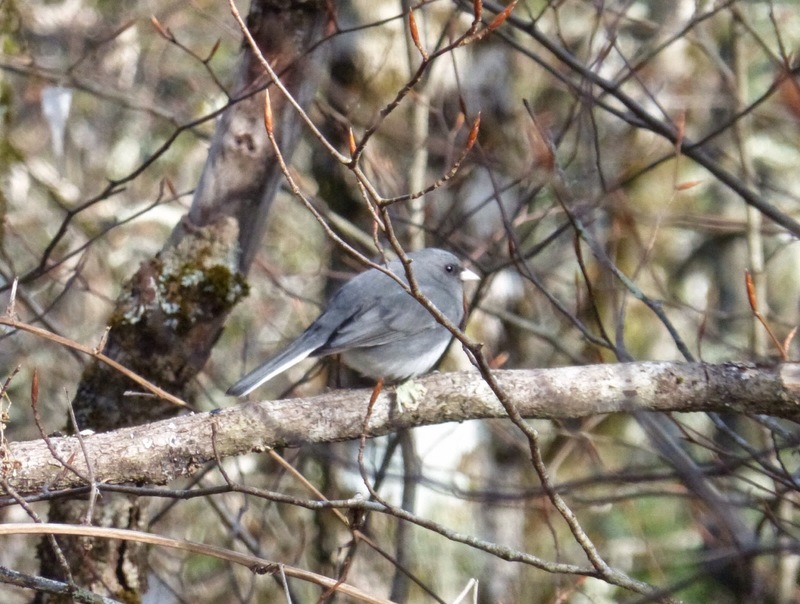 Your mystery bird is one you know well: Dark-eyed Junco. Ours out here have a good bit of brown and are the Oregon color morph; the ones on the AT have no brown and are the Slate-colored morph.